Monday was a snow day for many children in the region. The heavy snow that fell Sunday night into Monday morning left a lot of students home from school across New England. "We just kept packing it in between the cracks and put it underneath down there," said 9-year-old Nolan Bakst. Like many children across the state, Bakst had Monday off from school due to the snowstorm. 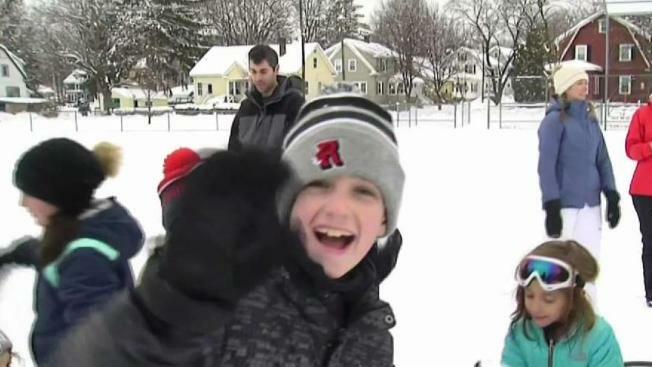 So he and a group of his neighborhood friends in Reading, Massachusetts, spent their morning building a snow fort. "Probably like an hour," said 8-year-old Zachary Renzullo when asked how long it took the group to build the structure. Their parents found out last night that they didn't have school Monday. "It was really nice that they called it last night so we actually could prepare and make sure that mentally, we were ready for the day," said Zachary's mother, Lindsay Renzullo. Some of the children were cold after playing in the snow for hours. "I'm still wearing pajama pants," Zachary Renzullo said. Still, they had plenty of fun work to keep them busy and hungry. "I delivered water," said Nolan's mother, Kerin Bakst. "And they're also eating a fair amount of snow," said Lindsay Renzullo. "They've probably eaten their body weight in snow." The fun will be short lived. The children return to school Tuesday. "That is the best thing that ever happened," said 4-year-old Olivia D'Orazio.